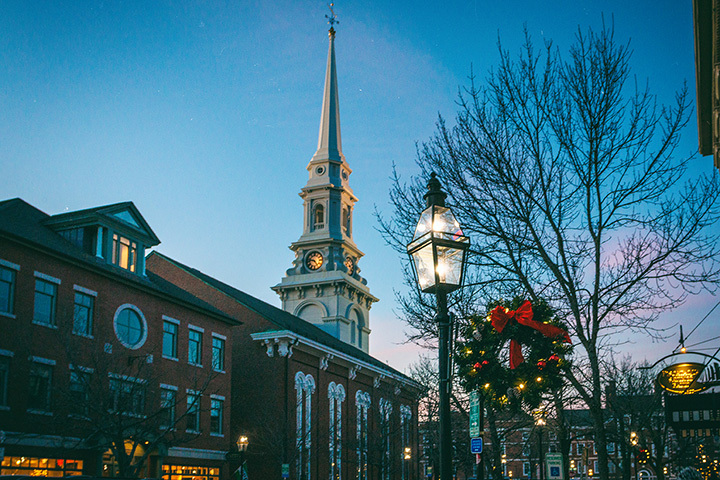 From heartwarming holiday musicals to festive parades with twinkling Christmas lights, here’s everything to know about what’s going on in Portsmouth, New Hampshire this week! The Music Hall is proud to present “Elf the Musical” in conjunction with the Ogunquit Playhouse. A visit to the Music Hall is a treat in itself. The fully restored 1878 Victorian-era historic theater features floor and balcony seating, along with a bar where patrons can enjoy cocktails prior to the show. The show—perfect for all ages—opens November 28 and runs through December 16. On Saturday, December 1 from 10 a.m. to 5 p.m., the Button Factory will open its studios to those who want to do some holiday shopping, as well as those simply browsing or wondering exactly what goes on in the historic Portsmouth building. Check out high-quality woodwork, pottery, photography, fabric arts, stained glass, sculpture, jewelry, paintings, and so much more. A preview date is also scheduled the night before, November 30, from 5-8 p.m. Only studio artists will be on hand Friday, while guest artists will be set up in some of the studios on Saturday. Secure your spot early to catch the Portsmouth Holiday Illuminated Parade & Tree Lighting, to take place on Saturday, December 1 at 5 p.m. Music will fill the downtown area, with the mayor will light the giant tree in Market Square at 5:30. The parade kicks off at 6 p.m. A food drive will take place during the parade, with student volunteers collecting cans all along the parade route. The parade starts off at the corner of Islington and Summer Streets and is absolutely a parade worth seeing. Fill your thermoses with hot cocoa or coffee and get ready for some wonderful holiday entertainment. Save yourself the aggravation of finding a parking spot and rely on Portsmouth’s free parking shuttle instead. Simply pull in to the parking lot at Connect Community Church on Market Street and ride the free shuttle downtown. A rain date for the parade is set for Sunday, December 2. Portsmouth and its surrounding communities plan for weeks in advance to attend Strawbery Banke’s annual Candlelight Stroll. 350 years of holiday and winter traditions are shared with guests as they visit Strawbery Banke’s furnished historic homes, replete with holiday music and the glow of lanterns. Vintage Christmas in Portsmouth has been featured by the museum since 1979, with some guests coming year after year to capture a simpler holiday time. A bonfire crackles on the grounds, adding even more merriment to the event. December 1 and 2 are the first two nights of the stroll, which extends through December 22. Check the website for exact dates and times, and to purchase tickets. Do note that the stroll goes on no matter what the weather is doing! Alas, even amidst the exciting holiday opportunities taking place in Portsmouth, it seems the city isn’t immune to those who try to spoil all the fun. Our Portsmouth Police Department keeps locals abreast of crime in the neighborhoods, and this week has posted pictures on Facebook asking for the public’s assistance in catching shoplifters. It is worth mentioning that while this is a serious matter, the Facebook page will certainly give you a chuckle.